“My friends told me about est for years and I never did understand why they wouldn’t leave me alone about it. After seeing this film and getting an in depth look at the man and what he cared about I now see what all the excitement was about – it was fascinating!” ~ Melinda R.
“I gave 5 stars to acknowledge what Werner’s humanity and commitment contributed to the world. When I think of him, I am moved to tears–not because of a fawning cult figure adoration. Like myself, I am aware of his many human flaws and failures. I am moved to tears because when I remember Werner Erhard, I remember who I am. “Transformation: The Life & Legacy of Werner Erhard” provides a look into who Werner Erhard really is and how his ideas have been making a difference throughout the world. In 1971, in a hotel ballroom in San Francisco over 40 years ago, transformation burst on to the national stage with the first est Training. Werner Erhard and the est Training brought to the forefront the ideas of transformation, personal responsibility, accountability, and possibility. Over the years, more than two million people from all walks of life and all kinds of backgrounds and educational experiences have brought about breakthroughs in their work and lives based on the work of Werner Erhard. This documentary by two-time Emmy winner Robyn Symon offer viewers a rare insider view into the life and ideas of Werner Erhard and highlights his enormous contributions to the quality of people’s lives, people’s relationships, the business world, academia and society. The film had its world premiere at the Palm Beach International Film Festival and broke the box office record at the QUAD Cinema in New York during it’s opening week. 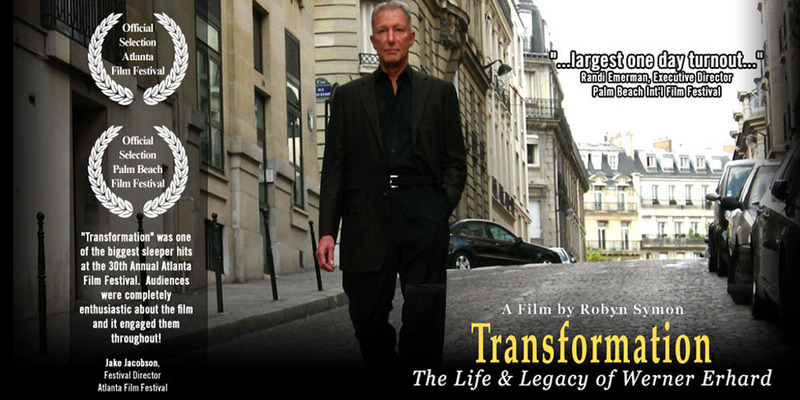 The film Transformation: The Life and Legacy of Werner Erhard, was featured at the University of Pennsylvania Bioethics Film Festival in April 2016. The festival featured a long conversation between Werner Erhard and Professor Jonathan D. Moreno. Jonathan D. Moreno is the David and Lyn Silfen University Professor at the University of Pennsylvania where he is one of sixteen Penn Integrates Knowledge professors. At Penn he is also Professor of Medical Ethics and Health Policy, of History and Sociology of Science, and of Philosophy. Watch the entire video conversation with Werner Erhard here. This documentary gives the viewer a look at who Werner Erhard really is, the revolutionary nature of his ideas and the difference they have made throughout the world. It features historic clips of the est training and highlights Werner Erhard‘s enormous contributions to the quality of people’s lives, people’s relationships, the business world, and society itself.